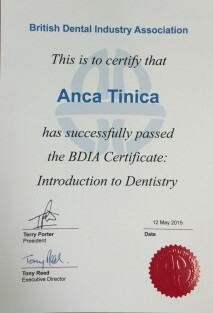 Late spring of this year Anca sat the BDIA Certificate: Introduction to Dentistry exam. The exam consists of nine modules covering topics all related to the procedures conducted at a dental practice as well as modules focusing on oral health management. The course is aimed at anyone in the dental profession, who did not come from a clinical background such as the customer service staff and marketing department, to enhance their understanding of the dental industry. Anca worked considerably hard for this exam on a frequent basis and her hard work paid off. She passed with flying colours coming very close to a distinction. Well done Anca! This November Conor and Elizabeth are due to sit the same exam and they are already working very hard towards it. We have every faith that they will follow in the same footsteps as Anca. Please join us in congratulating Anca on her great exam result and also wishing good luck to Conor and Elizabeth for their exam this November.